Many people believe that we are each put on this earth for a specific purpose: to love, to suffer, to teach, to battle, to learn humility, to help others find their voices. But, if one is placed here to learn a lesson that doesn't get learned, the consequence might be reincarnation to try again. I suspect that's why thirteen year old Clare from Bethlehem, Pennsylvania has returned as a scrawny cat in Bethlehem on the West Bank. And judging by her attitude, she still has a lot to learn. Clare the cat becomes immersed in a situation in the West Bank that has her reflecting on the circumstances that led to her death and her return as a feline struggling for food and shelter and avoiding skirmishes with other cats, including the king tom and his bunch. Her past human life and current feline existence are told in parallel lines, allowing comparisons between her role in her own demise and in helping to resolve a conflict in which she is essentially an observer. After being chased from the wall at a checkpoint from the West Bank to Israel, the cat sneaks into a small house when two Israeli soldiers break in, planning on setting up a surveillance on another residence. Happy for the safety, shelter and opportunities for food and the occasional scratch, the cat makes herself quite at home, even creating some of the same mischief she enjoyed in her previous life. When she exposes a young boy hidden under a toy city constructed of boxes and cans and other garbage, the two soldiers first restrain him as a potential threat before coming to his aid with an inhaler for his asthma and food. Sadly, the two Israelis do not understand the child as he chants and rocks himself back and forth. However, Clare the cat has the distinct ability to understand all languages spoken by humans and animals and recognizes the boy's repetitious murmurings as the famous poem Desiderata by Max Ehrmann (1927), words that she despises because of their negative association with a teacher, Ms. Sealand, whom Clare blames for her death. Aaron, the more seasoned soldier, a commander from Tel Aviv, is more intuitive about the boy than Simcha, the gun-happy young American private who came looking for a chance to fight and who is suspicious of everything including the scared little boy. Even while they wonder about the young boy's family, Aaron is able to empathize with the youngster, seeming him as vulnerable and as scared as any of them. But even the cat (who understands all linguistically) could never have imagined that the life lessons shared with her before she'd died as a thirteen-year-old girl would be others' salvation. Not that Deborah Ellis ever writes anything that contrived or convenient. Clare the cat doesn't just, bang, recognize how she can help resolve conflicts; Clare the girl never did. The cat is still essentially the brash female who absolves herself of any responsibility for the consequences her actions bring about. It's almost impossible for her to look beyond herself, to see the big picture, the context in which she experiences life. That is, until she realizes she must do something quite extraordinary. The concept of karma is well-illustrated in The Cat at the Wall, as is the idea of a purposeful life. But Deborah Ellis does not belabour these themes to teach responsibility or gratitude. She simply tells an extraordinary story of conflicts that can spiral out of control and be resolved by adherence to some simple truths. 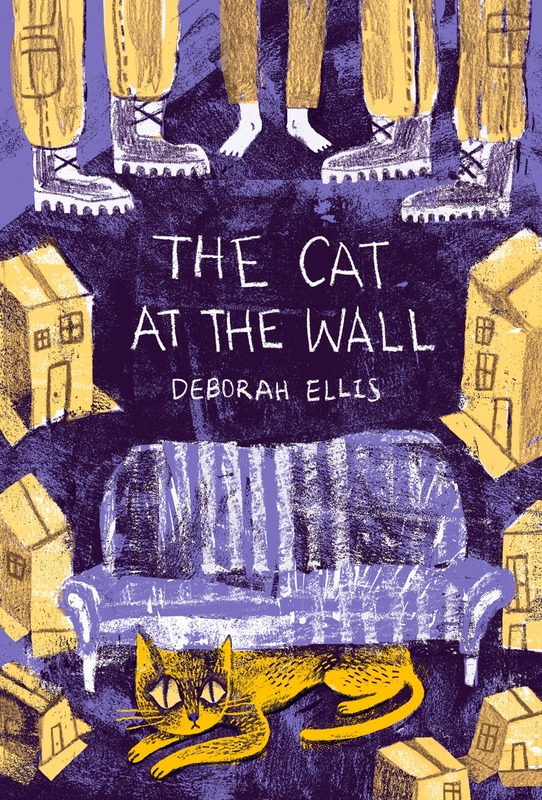 The Cat at the Wall is a touching allegory that should remind us all to live a life of goodness and honesty. It will be well worth it in the end. a beautiful world. Be cheerful. Strive to be happy.